While teeth cleanings help remove plaque and tartar, it’s important that you continue to practice good oral hygiene at home between appointments. We understand that each patient has their own unique oral health needs, depending on their age, medical history, and other factors. For this reason, our Kalamazoo, MI dentist takes the time to talk with you to discuss how to best meet your oral hygiene goals. One of the best ways to protect oral health is to brush your teeth twice a day for two minutes at a time. A common mistake we see is that patients don’t brush long enough or neglect to brush back teeth. The result could mean a mouthful of cavities the next time they see our dentist. Plaque loves to hide where toothbrush bristles can’t reach, which is why it’s important to floss once a day. Otherwise, plaque and tartar will build up between teeth and cause cavities. Plaque is an invisible film of bacteria that feeds on the sugar left behind on your teeth to produce acid. Over time, this acid wears away the protective enamel of your teeth and can lead to cavities. Our dentist in Kalamazoo, MI may recommend fluoride toothpaste and mouth rinse to strengthen enamel. Enamel is the white outer layer of your teeth that protects the more sensitive dentin underneath. The stronger your enamel, the less likely you’ll develop cavities. We offer in-office fluoride treatments and are also able to prescribe prescription strength fluoride toothpaste and mouth rinse as needed. Did you know that your diet can affect oral health? For example, patients who consume sugary foods and drinks are more likely to have cavities, gum disease, and other oral health issues. When you can, drink water after meals to help wash away any sugar left on your teeth. Dental hygiene not only protects your smile, but can help you save money in the long run on emergency care and tooth restorations. Our dentist want to help give you the tools you need to practice good oral hygiene for the rest of your life. 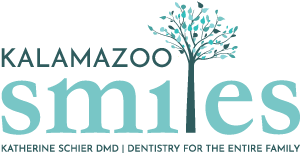 To request an appointment with our dental hygiene dentist in Kalamazoo, MI, call Kalamazoo Smiles at (269) 353-3700.